A fire at the old site of North Leamington School was put out by fire crews yesterday evening (Tuesday September 20). Three fire engines were sent to battle the fire at the site just off Cloister Way at 5pm, which was confined to the roof of the building. Crews were able to put out the fire after about half an hour. 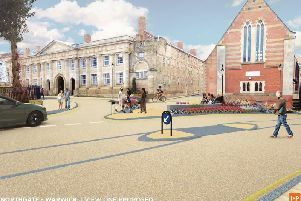 Warwick district councillors expressed disappointment at the low number of affordable houses included in the plans, but voted to approve the plans by eight votes to two.